When it comes to state flowers, Oklahoma's history has been quite interesting and sometimes controversial. Like many of the movements to adopt an official state flower, we can say it began with the World Columbia Exposition of 1893, the Chicago World's Fair. Selected to represent Oklahoma in the exposition's National Garland of Flowers and adopted as the territorial floral emblem, mistletoe went on to become the official state floral emblem in 1910, three years after Oklahoma achieved statehood. The story begins with an official floral emblem that many are loathe to refer to as a flower, per se, and dismissively refer to as a "plant;" mistletoe. Aesthetically, it possesses no attribute normally attributed to a state floral emblem; no attractive flower; no unique form; no commercial value. In fact, mistletoe is a parasitic plant. It survives by attaching to branches of host trees and shrubs and absorbing water and nutrients from the host plant. Host branches can be stunted and even killed. But this article isn't about mistletoe, Oklahoma's official floral emblem. It's about the adoption of the official state wild flower that gained attention some time after mistletoe was etched into Oklahoma's history, the Indian blanket. As alluded to above, not everyone was happy with the selection of mistletoe as the state's official floral emblem. The adoption of the Indian blanket (Gaillardia pulchella) as Oklahoma's official state wild flower in 1986 was initiated with Dr. Doyle McCoy. Dr. Doyle McCoy, an Oklahoma botanist, college professor, author, and public school biology teacher, chose to lobby for the adoption of the Gaillardia pulchella as the state wildflower for a simple reason: it has a high tolerance of heat and arid conditions, ensuring that a majority of the state could appreciate its promotion of Oklahoma's heritage and grace for the most of the year. Dr. McCoy approached State Senator Billie Jean Floyd, a former high school and university student of his who was now serving in the Oklahoma Legislature, with his idea to establish an official state wildflower to accompany mistletoe on the Oklahoma roster of official emblems. Senator Floyd partnered with Representative Enoch Kelly Haney, a Seminole-Creek Indian artist, to craft House Bill No. 1649 proposing that the Indian blanket (Gaillardia pulchella) be designated "the official state wild flower of the State of Oklahoma." SECTION 1. NEW LAW A new section of law to be codified in the Oklahoma Statutes as Section 92.1 of Title 25, unless there is created a duplication in numbering, reads as follows: The official state wild flower of the State of Oklahoma shall be the Indian Blanket (Gaillardia pulchella). SECTION 2. This act shall become effective November 1, 1986. So we looked at different things, and we came up with the Indian Blanket and him being a botanist, he thought that was wonderful because Indian Blankets grow all over this part of the country. So it was the way a bill is supposed to be done—I carried the bill in the Senate, and Kelly Haney, who’s the renowned artist today, the Indian—and also right now the principal chief of the Seminole nation. Well, he was in the House at that time, and Kelly Haney carried it in the House and I carried it in the Senate, and Dr. McCoy lobbied every one of the House—all 101 House members—and all 48 Senators—he lobbied all of them, and when I introduced the bill, and when Kelly introduced the bill, it passed with flying colors. Of course, we got a little kidding over it. George Nigh was Governor still. In preparation for a successful campaign, Dr. Doyle, Senator Floyd and Representative Haney commissioned Nettie R. Wallace to create a quilt depicting Gaillardia pulchella, the Indian blanket. The completed quilt's central blossom is composed of over 3,000 pieces. The border consists of a Seminole patchwork representation of the pumpkin blossom. As Senator Floyd described the legislative process, House Bill No. 1659 "passed with flying colors." Passed by the legislature on May 7, 1986, a bill signing ceremony and dedication was held on May 8, 1986. Governor George Nigh was presented with the commissioned quilt which, as of this writing, is displayed on the first floor of the Oklahoma State Capitol in Oklahoma City. The Indian chiefs of Oklahoma came to the state Capitol on Wednesday the Chickasaws and the Seminoles, the Otoes and the Apaches, the Wyandottes and the Delawares and they paid tribute to a newly revered symbol that only recently was promoted past the status of a weed. Principal chiefs or other representatives of more than 20 of the state's Indian tribes were the focus of ceremonies in the Capitol rotunda to initiate the Indian blanket flower as the official state wildflower. "This is not taking the place of the mistletoe," said Overton James, governor of the Chickasaw Nation. "It holds a special place in the hearts of Oklahomans." But May 8th, 1986 belonged to the new state wild flower a movement that had been fully backed by Indian tribes and garden clubs throughout the state. When referring to Oklahoma's original floral emblem, perhaps Betty Price, director of the State Arts Council summed up the general public reaction best. "It's not been easy to use as a logo," Betty Price, director of the State Arts Council, said before the ceremony. "But the Indian blanket will give us a beautiful new image." Two years after adoption of the Indian blanket as state's official state wild flower, the State House of Representative passed House Resolution No. 103 declaring every third Saturday of May "State Wildflower Day." The following information was excerpted from the Oklahoma Statutes , Title 25, Chapter 3, Section 25-02.1. §25-92.1. State wild flower - Indian Blanket. 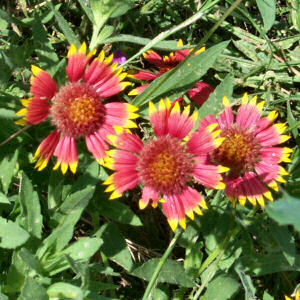 The official state wild flower of the State of Oklahoma shall be the Indian Blanket (Gaillardia pulchella). Added by Laws 1986, HB 1649, c. 6, § 1, eff. November 1, 1986. "Billie Jean Floyd - Senate 1984-1988." Oral History-Collections-Women of the Oklahoma Legislature-Oklahoma Women Legislators . Ohio State University Library, n.d. Web. 3 Aug. 2016. DeFrange, Ann. "New State Wildflower Honored." NewsOK Now . The Oklahoman, 8 May 1986. Web. 22 Mar. 2016. "Oklahoma Statutes." Oklahoma State Legislature . State of Oklahoma, n.d. Web. 30 Sept. 2015. Vincent, Melissa. "Indian Blanket." Encyclopedia of Oklahoma History and Culture . Oklahoma Historical Society, n.d. Web. 21 Mar. 2016. Wallace, Nettie. "Indian Blanket Quilt." Oklahoma State Capitol Art Collection . The Oklahoma Arts Council, n.d. Web. 22 Mar. 2016. Indian Blanket: Oklahoma Historical Society Encyclopedia of History and Culture. Blanket Flower: National Gardening Association. Gaillardia Species, Annual Blanket Flower, Firewheel, Indian Blanket: Dave's Garden. Plant Profile for Gaillardia pulchella Foug. (Firewheel): USDA, NRCS. 2004. The PLANTS Database, Version 3.5 (http://plants.usda.gov). National Plant Data Center, Baton Rouge, LA 70874-4490 USA. Oklahoma State Wildflower: "Legend of the Indian Blanket Maker" and Cultivation Information from the Oklahoma Roadside Wildflower Program. Lady Bird Johnson Wildflower Center: Web site for the Lady Bird Johnson Wildflower Center in Austin, Texas. State Wildflowers: Complete list of official state wildflowers from NETSTATE.COM. More symbols & emblems: Complete list of official Oklahoma state symbols from NETSTATE.COM. Oklahoma Wildflowers includes descriptions, color photographs, distribution information, full scientific name, one or more common names, family names, and flowering dates.The book is divided by flower color and includes each plant's common and Latin name, family name, height, flowering and fruiting habits and distribution, a glossary of botanical terms used in the book, a bibliography and an index. 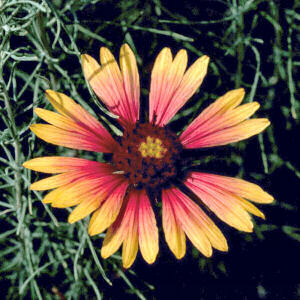 The cover features a color photo of Indian Blanket. Folley has photographed and described the two hundred wildflower species that are most commonly seen along roadsides and in parks throughout the state. She provides at least two photos for each plant, showing the entire plant as it occurs in the wild, outside of cultivation, along with a close-up of its flower. Each plant is keyed to a particular geographical location and a particular family, and an index to colors is a further aid to identification. If a species is native—such as big bluestem, the defining grass of Oklahoma’s tallgrass prairies—Folley presents this information in the text along with time of blooming, size and color of blooms, preferred habitat, and common and scientific names for all species. Alan McPherson is a naturalist who resides in northern Indiana and enjoys traveling and learning about the botanical resources our vast country. In this reference book over 200 state botanical symbols are presented with informative text that highlights their adoptive legislation, botanical and social history. From the white pine of Maine's northeastern forests, westward to the yellow hibiscus of Hawaii's Polynesian islands, our state's official botanical symbols are as uniquely diverse as the terrain and character of the 50 states themselves. 51 accurately detailed, copyright-free renderings include national bird (eagle) and flower (rose) plus 50 state birds and flowers. Plants, Seeds & Flowers : Bulbs, seeds, plants, fertilizer, plant containers, garden tools and more.